The Good Spoon is a unique culinary creation created by Algama Foods. By replacing eggs with microalgae, we’ve produced a range of light, vegan mayos. The Good Spoon mayos contain up to 60% less fat than regular versions, are GMO-Free, Preservative-Free, Allergen-Free and Cholesterol-Free. 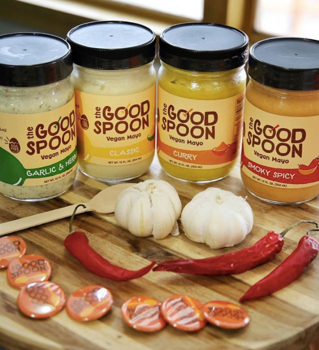 Great for Vegans & vegetarians, foodies, conscious moms or healthy students, The Good Spoon is also affordable, making it a great condiment for all! from Friday, June 30th to Monday, July 2nd. In addition to these events, Alvyn Severien, our CEO will be inlvoved in a Panel, hold by Phil Kafarakis, President of the Specialty Food Association, of “Disruptive Thinkers”. Besides, he has been invited to talk at the SFA Live show by Phil Lempert, the supermarket Guru! If you’re planning on attending the SFFS18, please let us know – pr@thegoodspoonfoods.com, so we can schedule a meeting. In the meantime, see below for more information. Algama was founded by 3 childhood friends in Paris a few years ago, who wanted to bring vast changes to the current broken food system. They found a unique solution in microalgae (or microscopic seaweed). Now based in NYC and Paris, Algama has strengthened its expertise through years of research and development. The Good Spoon, our range of vegan mayonnaise, is the result of a strong collaboration between our scientific team and our food designers. These products have received significant awards and recognition from the food industry including the Carrefour Innovation Award. We also represented the Future of Food at the Level Up Pavilion during the Summer Fancy Food Show 2017 (pre-market launch), and was chosen to be part of the Seed&Chips Food Future Pavilion in this year’s the Summer Fancy Food Show. The Good Spoon is now available in 100 stores in NY Area - Brooklyn, Queens and Manhattan- such as C-Town, Brooklyn Fare, Brooklyn Harvest or Morton Williams. We are also distributed in 200 stores in Paris, thanks to our partnerships with Carrefour (4th global retailer) and Casino Group (19th global retailer). Our presence at the Summer Fancy Food Show will strengthen our development in the New York metropolitan area and help us to set up our online distribution. Soon thereafter, we are targeting North-East expansion and development on the West coast. Recently, we took part in many large food events such as Food Loves tech, the NYC Vegetarian Festival or the Tri-state Vegetarian Festival with many more including The FAD Market or The Black Vegfest!